How cool is this..!! 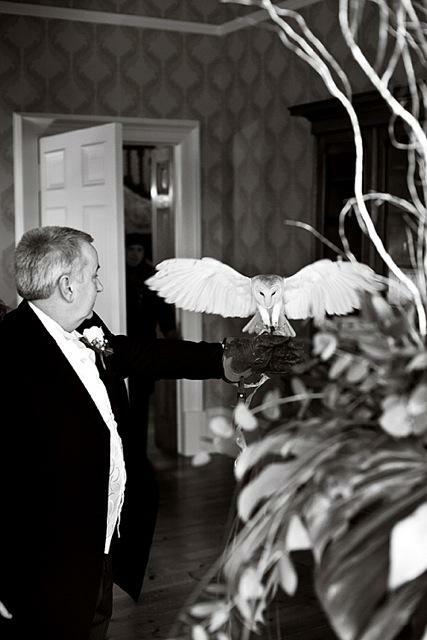 Look at this owl delivering the wedding ring...Very Harry Potter! Hoscote Estate nestles in the Roberton Valley, in between Newcastle and Edinburgh. it is surrounded by outstanding scenery of the Scottish borders. Hoscote specialises in relaxed house-party wedding celebrations and is available on an exclusive use basis. They have a dedicated in-house wedding planner who has all the experience you need, to help you put together your perfect wedding day. How Harry Potter-esque is that!! We think this is such a great idea and shows the attention to detail that Hoscote can deliver. Is this for real? I'd have thought it was dangerous letting an owl near your ring! Got to be an April fool. This is very definately for real - we love it!